In preparing for my Christmas Home Tour, I wanted to share a few ideas for creating small Christmas vignettes that could be used in a variety of areas throughout your home. In this post, I use the same tray and home decor items for each vignette to show you how easy it is to mix it up, depending on the style of your home. Hopefully, this will inspire some creativity as you go about decorating your home for the holidays…my favorite time of the year!! Thank you for stopping by to see these tips on Decorating a Tray for Christmas 6 Ways. This post contains affiliate links to keep this blog up and running. Norman Vincent Peale, who wrote the best-seller, “The Power of Positive Thinking” once said, “Christmas waves a magic wand over the world, and behold, everything is softer and more beautiful”. The Christmas “magic wand” has been waving it’s magic wand all over my house these days and it is so happy! Each one of these designs starts with these basic pieces that I pulled from my coffee table….a tray, a natural element, and a glass candle holder. I have used these Uttermost Brisco Carved Wood Finials, Set of 2 for so many applications. You could use your own pieces here…no need to buy anything new. However, there are links below if you would like to buy similar pieces. This is certainly my biggest post to date, but hopefully, you can hang in there! Having so much fun, I just couldn’t stop!! Please vote in the comments section below for which one you like the best and I will announce the winner! Having had this little guy for a couple of years, featuring him was an obvious fit! Plus, he fits in beautifully with the decor in my home. Surely, you have a favorite Santa or two?! He is surrounded with the white/green sprigs that I purchased last season from Michaels. They add a lot of texture without working too hard, making it super easy! Pre-made sprigs are worth every penny. 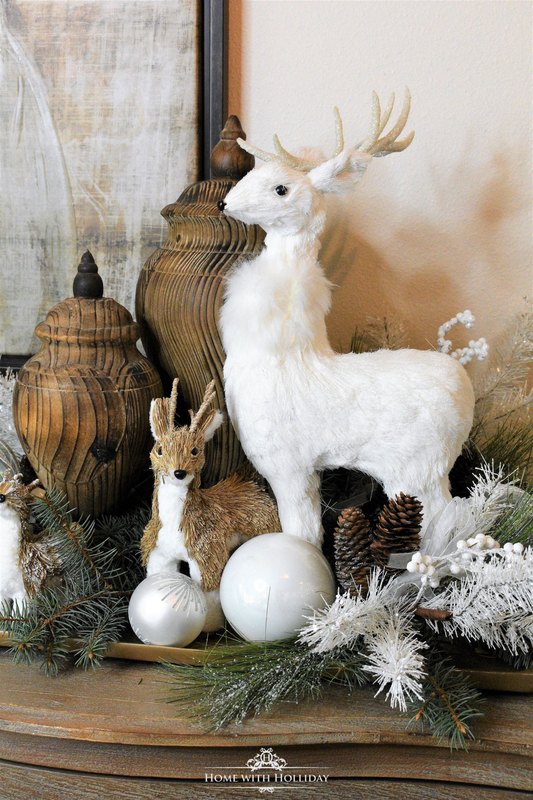 For this vignette, the inspiration began with the white deer I bought for my Rustic Winter Table Setting. Click here to see! The white deer was purchased from…yes…BIG LOTS for only $17.60 each! Using the same white and green sprigs (pine cones included) from above was a natural fit. All that was left was adding in the shiny, sparkly ornaments. Be sure to use a good variety of textures and sizes. Finally, I added in the two cute tiny ornamental deer. Soooo cute!! This is one of my most favorite Santas!! Not only is he handmade and authentic, he is a perfect addition to anywhere he is placed!! He looks so great next to the wood urns. Wanting to display a natural look, I simply cut a few branches off one of our spruce trees and placed them around the finials and the Santa. Secondly, I added in the adorable rustic candle holders ($4 each!) from Big Lots (yes, Big Lots!! ), the pine cones (from my yard) and then the coordinating ornaments. This particular Santa is another favorite because it was a gift from a special friend that knew how much I love them. Years ago, my cousin, Barbara-Ellen nick-named me “Fancy”, so I couldn’t help bringing out some “fancy” in this look. Wanting to keep the greenery simple, I used the same fresh spruce cuttings used above. To complement the “fanciness” of the Santa, I selected more fancy ornaments with sparkle, elegance, and glitter. This is the place to use your best, most cherished ornaments. The finishing touches included the glittery sprigs and the gold glass and mercury glass votive holders. Copper, gold and rose gold are tones that are very popular these days. This little Santa has been a part of my collection for years. He also fits in nicely with my rustic, winter theme being used throughout my home this year. For this design, I mixed in pine cone ornaments with the real pinecones for added texture and glam. The beaded pear ornament topped it all off! Again, laying in a variety of votive candle holders adds great flair and warmth. Years ago, I started collecting nutcrackers and love featuring them during the holiday season. They are classic and colorful and bring back so many memories of Christmas’ past. I have several “collectible” nutcrackers (not shown here), but these are inexpensive replicas that are easy to find. You probably have a few of them yourself already. After placing them on the tray, I popped in the same natural greenery from my yard. The rest was super simple…just adding in a couple of colorful ornaments and some votive holders. Done! Hopefully, this inspires you to be creative with many of the Christmas decorations you already have. Which one is your favorite?? Thanks for stopping by today! To see my Christmas Home Tour posts, click on these links below. In these posts, there are links to shop some of the looks I have shared and see the details of how the designs were created. I would love to hear your feedback on this post, especially to vote on your favorite! I love the rustic Santa set up! so cozy. Thank you so much, Katy!! All is beautiful. Keep sharing. Thank you so much, Dorothy! I appreciate you stopping by! Happy New Year!